Record Validation Live is a feature that can be integrated to any record page layout in your Salesforce organization. 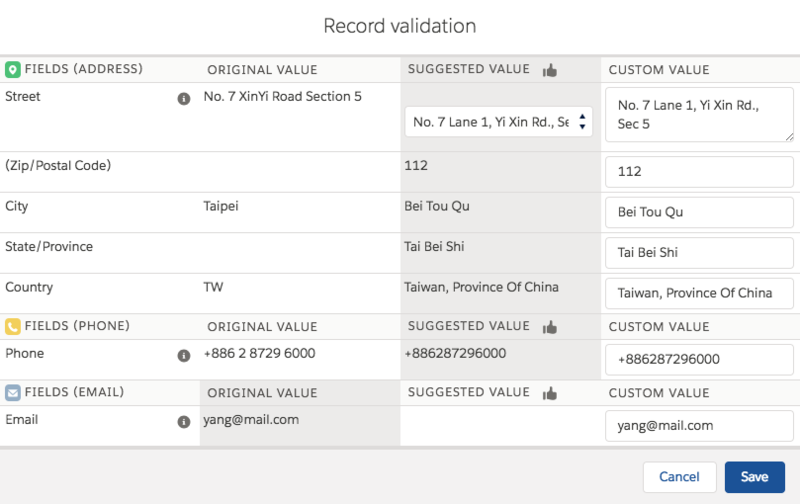 Record Validation Live does a real-time search and presents all setted up fields and their validation status when opening up a record. Instantly validate these fields for the record you are currently working in. Field Validation field. All fields added and mapped that contains a value from the Object Settings can be added to this component. Message Current field status from Record Validation Live service. Field Status - Field data has been changed, needs to be validated again. - This field has not been validated yet and needs validation. - The current address is validated up to a city level. Choosing a suggestion will change it to green status. - This field is correctly validated. - This field cannot be validated due to unusable data. Record Status is a colorful text field indicator that indicates the status of the viewed record. It will take the lowest status from your record. If you have at least one field with red status code in your record, the overall status code of your record will be red. This rule applies to every status. The 'Validate all' button shows a pop-up configuration page giving the option to validate all fields on the same page. The 'Validate' button shows a pop-up configuration page giving you the option to validate a single field. Field Validation field. Can be Address, Telephone number or Email address. Original value Original field value. Suggested value Suggested value from Record Validation. Custom value A field where you can write down your desired custom value. Hover the info icon the see the current status of the field.